Scope of work at Lewis and Clark College included studies for a new gateway entries, parking areas, a traffic roundabout, and master plan for an addition to the Boley Law Library at the Northwestern School of Law. As a contingency for the future implementation of master planning on the campus, certain infrastructure improvements were also required. The Roundabout at the entrance to the Law School is one such improvement that not only replaces a dangerous condition, but also creates a new front door to the School of Law. The solution required a design to consider long-term maintenance, visibility from a traffic standpoint, and seasonal interest. A sculpted berm was created to give definition to the asymmetrical road layout. 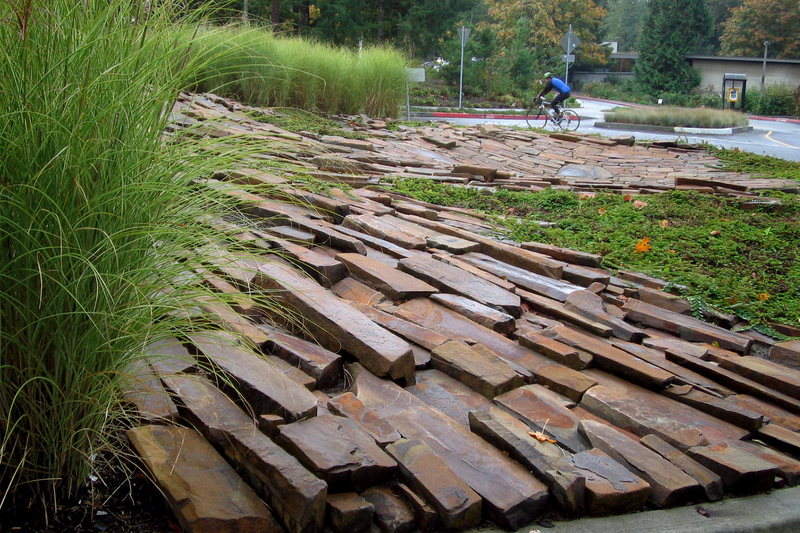 Massing of ornamental grasses and groundcover were selected to soften the circle, while basalt slabs of varying sizes are laid out in linear sweeps, accentuating the curvature and slope of the berm.